David Ortiz watched his second two-run home Monday against the Blue Jays. TORONTO — David Ortiz had one hit over the weekend against the Kansas City Royals, part of a longer slump that dropped his batting average to .249. There was one home run this month. Some hitters get grouchy during tough times, but it’s rare to see Ortiz lose his swagger. Ortiz did more than talk about it. He showed up at the Rogers Centre about five hours before the Red Sox played the Toronto Blue Jays Monday night and spent 45 minutes on the field taking extra batting practice. As assistant hitting coach Victor Rodriguez fired pitch after pitch to him, Ortiz worked on getting his swing back, sending balls soaring into empty seats. The payoff was immediate. 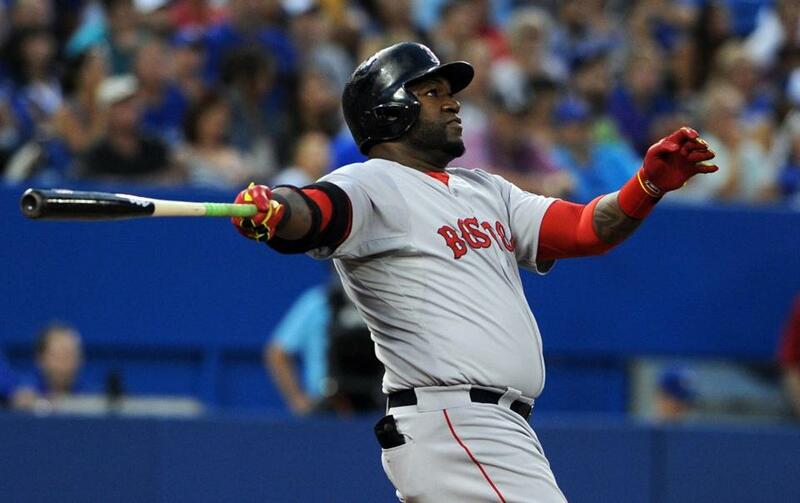 Once the game started, Ortiz drove in four runs with a pair of home runs as the Sox beat the Blue Jays, 14-1. Ortiz now has 453 home runs, moving into 36th place all-time ahead of Red Sox legend Carl Yastrzemski. His 22 homers this season are tied for fifth in the American League. Ortiz had little to say after his notable night, walking past a group of reporters waiting at his locker. “Put it down like that — I’m on my way to Jamaica,” was all Big Papi said before leaving the clubhouse. “Classic,” said teammate Jonny Gomes. Where are the Sox going? They have won five straight and eight of their last nine to improve to 47-52. Monday was the first of 13 in a row the Sox will play against division opponents, a stretch that surely will determine whether their season can be saved. The Sox have been a different team in the last nine games, scoring 57 runs and hitting .307. The 14 runs, 18 hits, and four home runs Monday night were all season highs. Every Red Sox starter with the exception of Dustin Pedroia had at least one hit and six players drove in at least one run. “Guys are playing loose. Guys are playing confident and we’re playing to the capabilities over this stretch we felt would be the case over the course of the year,” manager John Farrell said. Stephen Drew was 2 for 4 with a homer, a walk, and four RBIs. Jackie Bradley Jr. was 2 for 5 with two doubles and two RBIs. Daniel Nava had three more hits, as did Xander Bogaerts. Rookie catcher Christian Vazquez is playing a big role in the resurgence. The Sox are undefeated in the five games he has started and Vazquez has seven RBIs in those games. John Lackey (11-6) allowed one run on two hits over seven innings for the win, retiring the final 15 batters he faced after giving up a run in the third inning. Lackey struck out three without a walk and threw only 76 pitches. “Kind of fun to have these every now and then,” Lackey said. “The way [we] were swinging the bats, I was trying to get some quick outs and get those guys back out there. Toronto starter Drew Hutchison retired the Sox in order in the first inning on 10 pitches. Nine of the next 14 batters had hits as Hutchison (6-9) was charged with six runs. Napoli started the second inning with a double to the gap in right. Singles by Nava and Drew scored the first of what would be many runs. Vazquez reached on a two-out infield single to drive in Nava. The Sox scored four runs in the third inning, all with two outs. Napoli and Nava had singles before Drew lined a home run to right field, his third of the season. Drew is 7 of 17 in his last five games, improving his batting average from .128 to .175. The adjustment period he needed after joining the team in June seems finished. Said Farrell: “We all know he jumps in midstream. Basically his first 60 at-bats are probably his spring training. You see it coming along. The timing’s been better. The defensive highlight came in the fifth inning when Holt made a leaping catch at the wall in right field to take at least a double away from Dan Johnson. “I was kind of shaded that way. I chased it down and timed my leap right at the wall and was able to come down with it,” Holt said. Holt was smiling when he emerged with the ball. The middle infielder has played seven positions this season and somehow seems comfortable at all of them. Even Holt can’t quite believe it.